Al-Jazari was an Arab Muslim scholar and polymath who lived during the Islamic Golden Age. He was born in 1136 CE in the city of Jazirat ibn Umar, which is what gives him the title of “Al-Jazari”. He was a man of many talents; other than being a renowned scholar, he was also a skilled inventor, artist, craftsman and engineer. We don’t know much about his life, other than the details he provides in his own books. He followed in the footsteps of his father and held the post of chief engineer at the king’s palace. Al-Jazari was an artisan and was predominantly interested in the functional aspect of things which makes him more of an engineer than an inventor. He was a brilliant mechanical engineer, and built dozens of ingenious contraptions. His contraptions were always elaborate and ornate. He designed more than 50 different types of devices including clocks, fountains, hand washing devices, musical devices, machines for raising water etc. His most famous book, titled “The Book of Knowledge of Ingenious Mechanical Devices” was written in 1206 and presented to the Sultan as a gift. In it, he designed and described over a 100 mechanical devices, of which a great many were meant for entertainment value rather than to serve any practical purpose. For instance, he designed trick vessels which appeared to have water in them but when someone tried to drink out of them they were empty. In his books, Al-Jazari gave step by step instructions about how to build any of the machines and devices described therein. His books are an invaluable store of knowledge about early Muslim engineering. They were unique and successful because unlike other authors, he had minutely described each detail of his machines and the instructions were so well organized that many future craftsmen were able to enjoy the benefits of his skill. One of the most valuable things that he created was a water system for supplying water to various parts of the city. It was operated by hydropower, by taking water from the lake and turning a scoop wheel with a system of gears to transport water up the water channel and into mosques and hospitals. In all, Al-Jazari invented five machines for raising water, along with various watermills and water wheels. Some of his contraptions were so modern that it is hard to believe they were built eight centuries ago. One of these was an automated waitress that served drinks. The drink was stored in a reservoir tank, from where it poured into a bucket, then into a cup, after which an automatic door would open and an automaton waitress would appear holding the drink. Similarly, he built a hand washing device to perform ablution that utilized a modern flushing mechanism with a lever which would flush the water down when it was pulled. He also built a peacock fountain in which automated servants would offer soap and towels to guests when they were done washing their hands. Other devices include a musical robot band that would float on water and play instruments to amuse guests and several different types of clocks including candle clocks, elephant clocks, castle clocks etc. These clocks were very elaborate, complex devices and when they would strike the hour, a cacophony of sound would ensue along with sprouting of water in fountains. 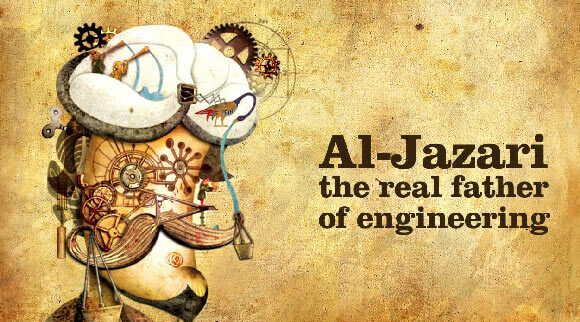 Al-Jazari utilized a complicated system of pulleys, levers and weights to build his devices. The ingenuity and skill demonstrated in his craft is widely respected till today, and he is remembered worldwide as a dynamic and talented craftsman and engineer.